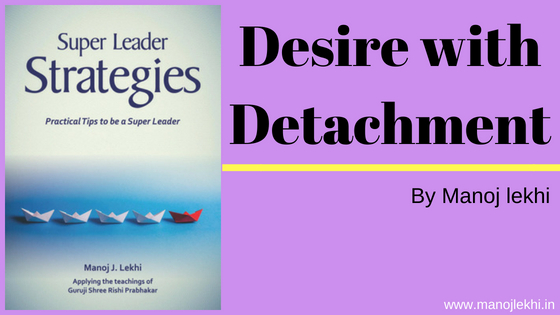 An article from the book ‘Super Leader Strategies’ by Manoj J Lekhi. The Bhagvad Geeta (chap. 2.47) says: karmanyevaadhikaaraste maa phaleshu kadaachana maa karmaphalaheturbhoormaa te sangostvakarmani. is a desire and not to do something is a desire as well. In fact desire is the base energy for life to happen and for everything in life to progress. Let us see how a human being is born. When a man and woman come together and pro-create, that itself is a desire. In the process the child is conceived that too is the result of a certain desire. So when the origin of life itself is a desire, naturally our entire life will be desire. Then what does the Geeta shloka that we discussed imply? To clarify, it doesn’t mean not to have desires but it means not to get attached to the desires. What does it mean to not get attached to the desire? in the world or make a difference in peoples’ lives or in any situations, then we will act upon it. If, for example, I don’t even have that want, then I will just be sitting on the fence. So having a desire is important but letting go of the desire is even more important. Wanting something will create energy. So, having desires is not so important but letting go of attachment to want is important. Wanting is important. Letting go is even more important. The ‘letting go’ aspect is what makes life more beautiful. Letting go is what our ancient scriptures talk about. Letting go is detachment or vairagya or non possessiveness. If we want to go to some place but if due to some circumstance we do not manage to go there, we must not be attached that it must happen. It’s perfectly okay even if it does not happen. When there are two teams playing cricket, if we do not choose a team we would like to win, then there is no fun in watching the game itself. The fun and excitement arises only when we choose one over the other and we experience the thrill of winning or the pain of losing. When the pain of losing is there, the intensity is there and when we let go of the pain of losing and restart again then once again the cycle of excitement begins. Let’s say two teams are playing and I do not choose any one and I say, ‘Let either team win. I am okay.’ Then it’s a very lukewarm attitude and there is no excitement and just a simple and dull way of living life. It becomes enthusiastic and exciting when we choose one over the other. on it till he gets it and may even throw tantrums. His persistence is so fantastic. If he gets it is fantastic. But if he throws tantrums but is diverted, he forgets it in minutes. That’s his ‘letting go’. This is the essence of having a desire and yet being okay to let go. So in having desires there is nothing wrong. In fact one must have desires to bring about a transformation in events,situations, world and people. Evolution happens through it. But getting attached to the desire, ‘It must happen; it should happen; it has to happen’, these words will create lots of pain. winner but I purposely chose Pune to win and towards the end they were winning but they lost in the last ball. I felt pained. I questioned myself: Why did I get the pain? I realized I purposely wanted one particular team to win and when it lost then the pain came in. I thought to myself if I had not chosen one, then I would have lost interest in that particular game. So, therefore I purposely chose one team. Then instantly the game had lots of excitement for me. I let go of the pain the moment I realized I wasn’t detached. This is how life is itself. We have to create a purpose in life and then we can keep on living and living for a long period of time. If we do not have a purpose in life, then life becomes boring, dead and monotonous and we can be sure our end is near. Enjoying the senses is beautiful, nothing wrong with it but holding onto them will cause a lot of pain. So you can enjoy the taste of food, smell of flowers, the beautiful sights, the lovely sounds and the wonderful touches but getting attached to it and wanting it in a particular way will cause a lot of pain. another chapter becomes important here. Focus to be 49% on desires and 51% on letting go of the desires. 49% we go for it, 51% we let go of it. A Super Leader masters this combination and lives life to the fullest.